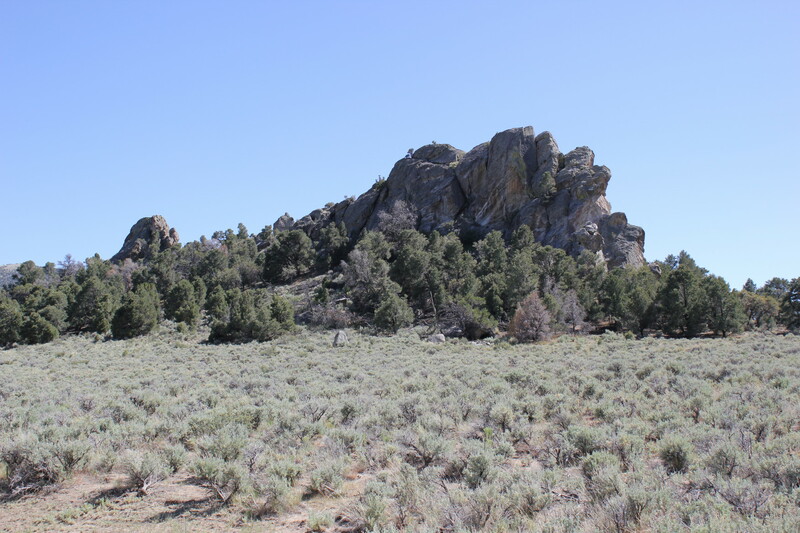 One of the places my husband wanted to go to was a place in Idaho called “City of Rocks”: it’s a “National Reserve” which is somewhat like a National Park but without the status of a park. Being the rock hounds that we are, it sounded pretty inviting. 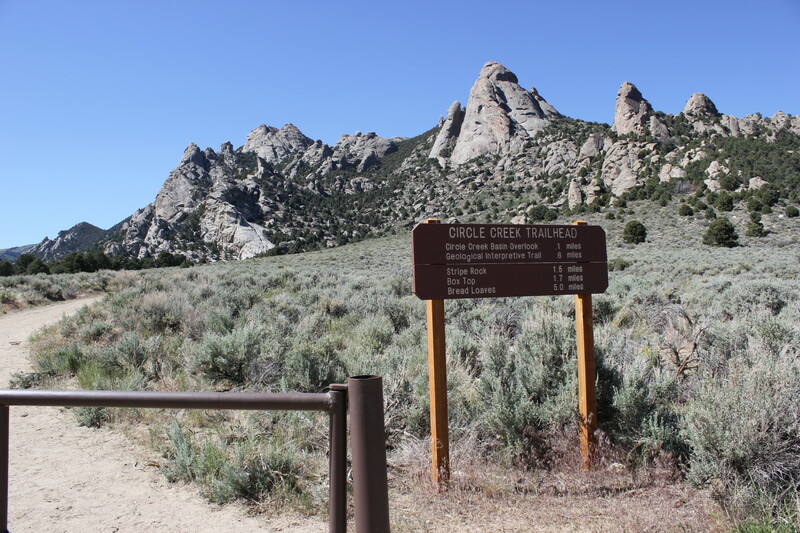 The history of the California Trail was something of an attraction as well: City of Rocks was one of the places where the westward-heading emigrants parted ways. 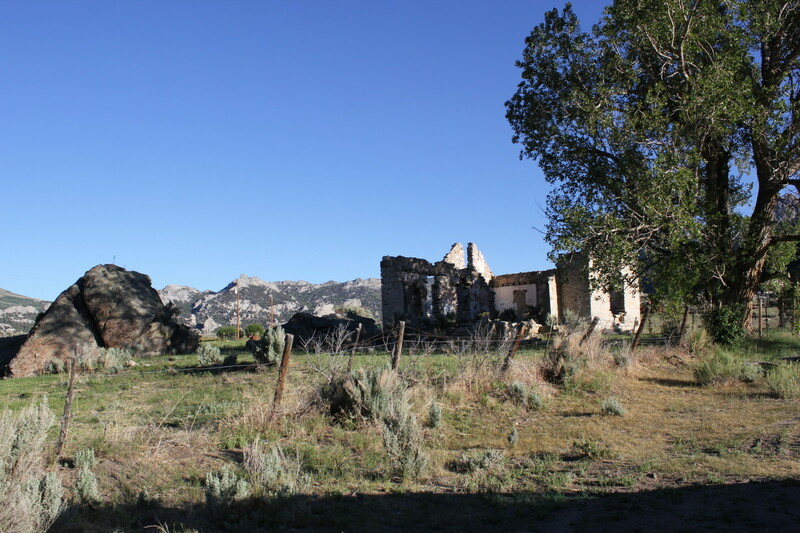 Some stayed on the Oregon Trail but others were drawn by tales of gold and riches and opted for the southern route through Nevada and into California. First, we had to get there. It didn’t look like we were going to have nice weather, either: big thunderheads chased us across north-central Oregon to La Grande where we spent our first night with family (and where I snagged a copy of The Help by Kathryn Stockett – and if I remember, I’ll do a book review on it sometime). By the time we reached the State of 75 mph (otherwise known as Idaho – Oregonians who are relegated to 65 mph and 55 mph will get the reference), the clouds were all gone. 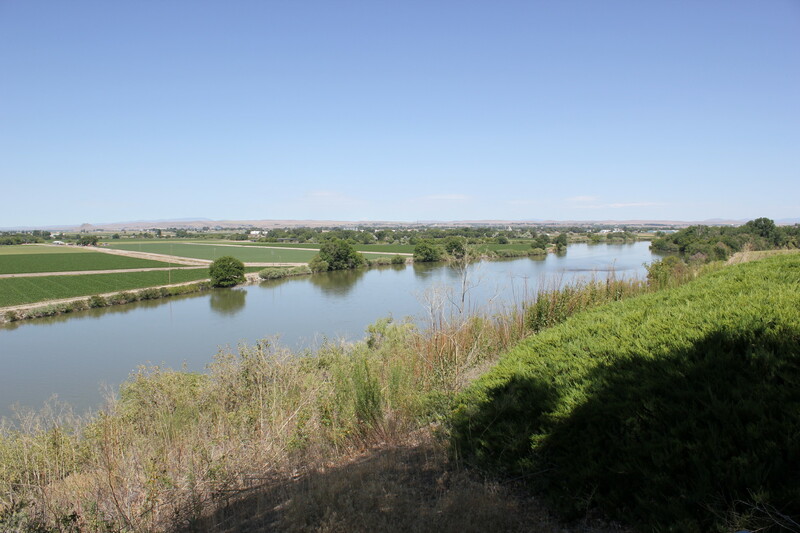 This is the view over the Snake River from Idaho looking into Oregon. Nothing but blue skies (what song does that remind you of?). 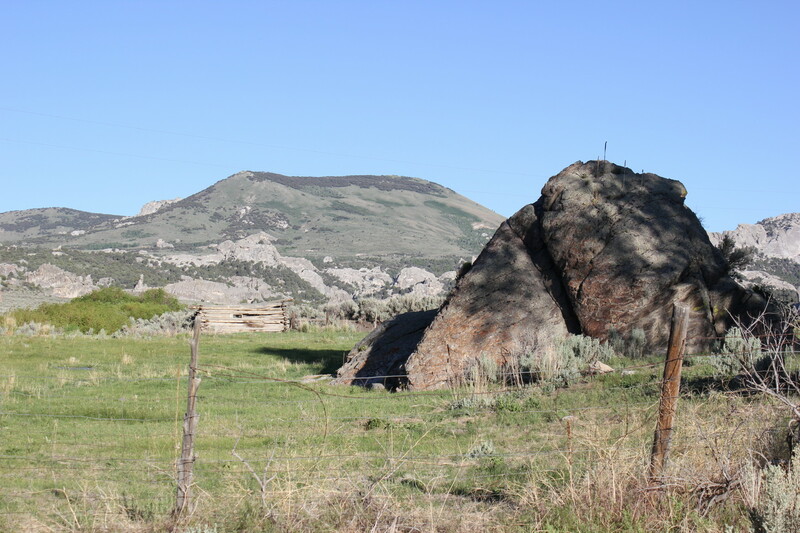 City of Rocks is south of a small town called Burley. It’s all paved roads until you get to the actual Reverve, and then it’s gravel. We stopped at the park headquarters to review the kiosk, looking specifically for fire restrictions and any information on campsites. There was a little map that we picked up that gave a general history and showed where all the camp sites were. We didn’t go in to the HQ as we didn’t feel we needed to. Perhaps we should have, because – perhaps – they could have told us the camp grounds were nearly all full. It’s a world of amazing granite spires. Emigrants who came this way carved their names on the smooth sides of some of the granite boulders. Those names are still there for us to see, along with the names of more recent travelers who feel a need to deface anything and everything historic. But, then, I guess their ancestors were the first ones to carve their names on the rocks. I have a theory about petroglyphs, too. My father handed it down to me: petroglyphs are ancient Indian grafitti. 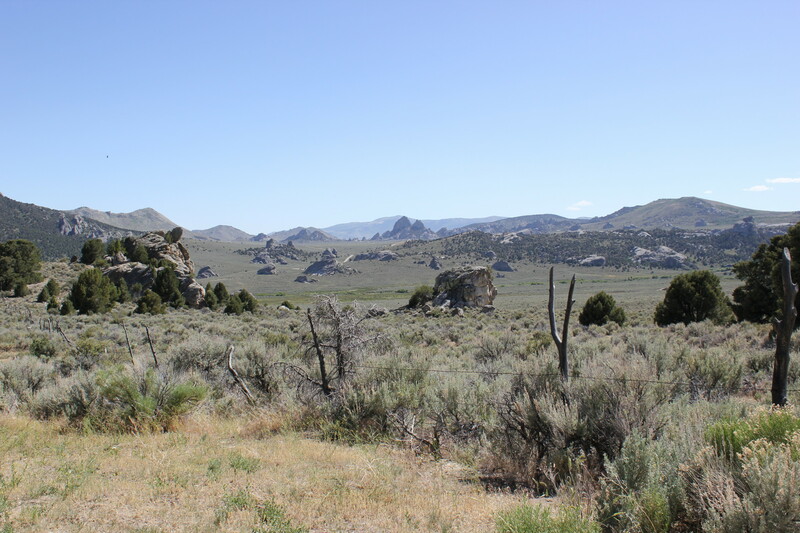 We couldn’t guess from the early panoramas what we would be facing when we actually got to looking for a camp site. Aw, it’s in bloom! These suckers jump out and grab you, so you have to be careful around them. We had Murphy, but he was very good. 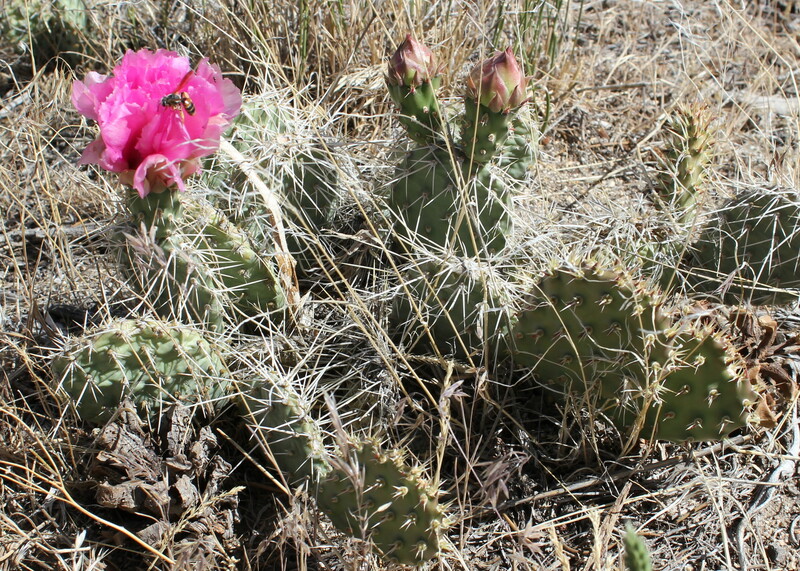 Don said he’s had to pick cactus thorns out of Murphy’s feet before: this is a widespread cactus of Oregon and Idaho. And no, I really have no idea what the Latin name is for it but I’m sure there are cacti experts who could tell you. I have one growing in a planted out front. It’s a bear to repot and extremely vicious when I try to weed around it. And it has never bloomed. Unfortunately, I didn’t really get any photos of the massive spires we drove through when we reached the center of the Reserve. For one thing, we were on a one-lane dirt road and we were starting to get desperate for a camp site. And for another thing, the place was crawling with tanned athletes and their climbing gear: walking along the road or rappelling and scaling the vertical walls of the sometimes 300-foot tall spires. And every single camp site we pulled up to was either occupied or reserved for that day. So many empty camp sites and so many RESERVED tags!! We found the one place where you pay for your camp, but we didn’t know where we were going to camp yet. We picked up an envelope and set back out on our search for a site. I looked in the side-view mirror and groaned. We were not laughing about this. We didn’t even know if there was a Les Schwab Tire Center in Burley, some 20+ miles away. What we did know was this: we weren’t going anywhere. We weren’t looking for another camp site. The place where we were at was vacant. We were staying. So, we unloaded and Don got out the spare. 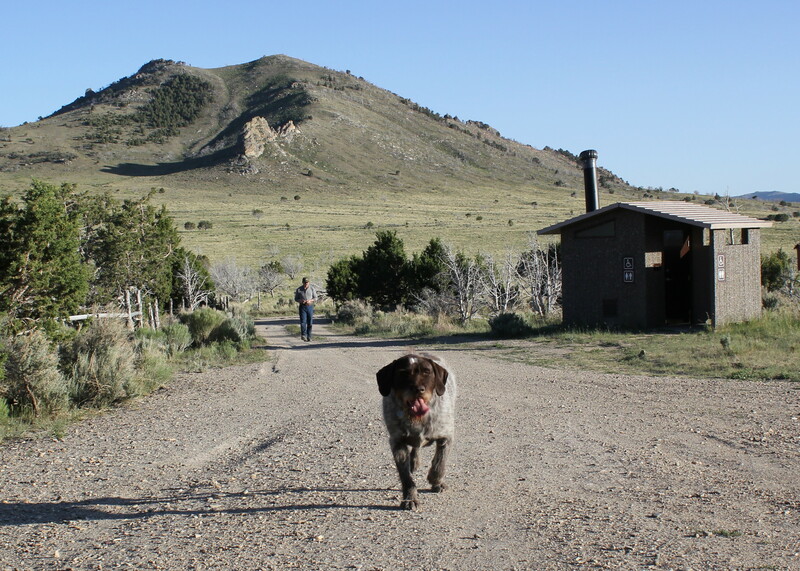 Murphy was very happy to be able to roam freely since no one else was within miles of us. Unfortunately, the camp site we were stuck at was a designated Group Site for no less than 12 people at a whopping $38/night. Plus a fine for camping there if you weren’t a group. And no discount for the lack of interesting geology or rocks to climb. And the pay station was five miles back the way we’d just come. Where we got the rock that stuck in the tire that let out the air in a freaking big hurry. It really wasn’t a bad site. One picnic table, lots of shade, some old corrals. What it lacked in vistas, it gained in privacy. And in the morning, we were back near the northern entrance of the park, taking photos of an old stone house situated on private land within the Reserve. 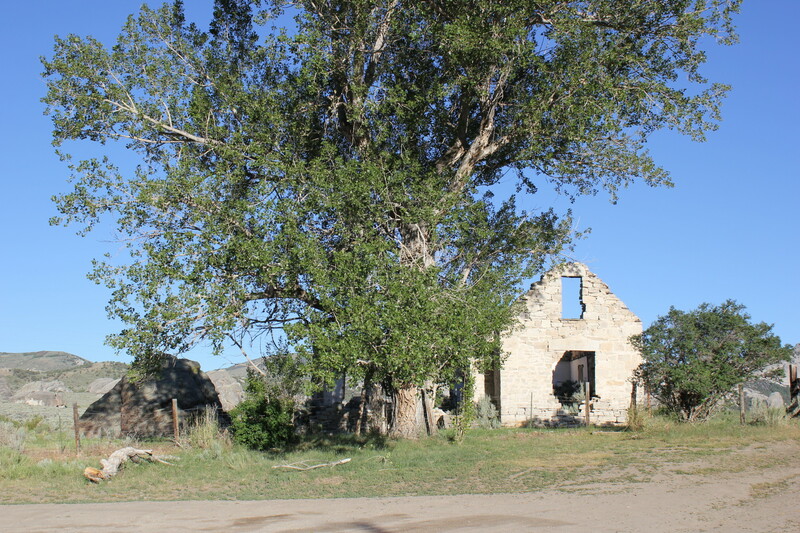 The old cottonwood hanging over the remnants of the homestead and the huge boulder next to it made for a nice framed photo. 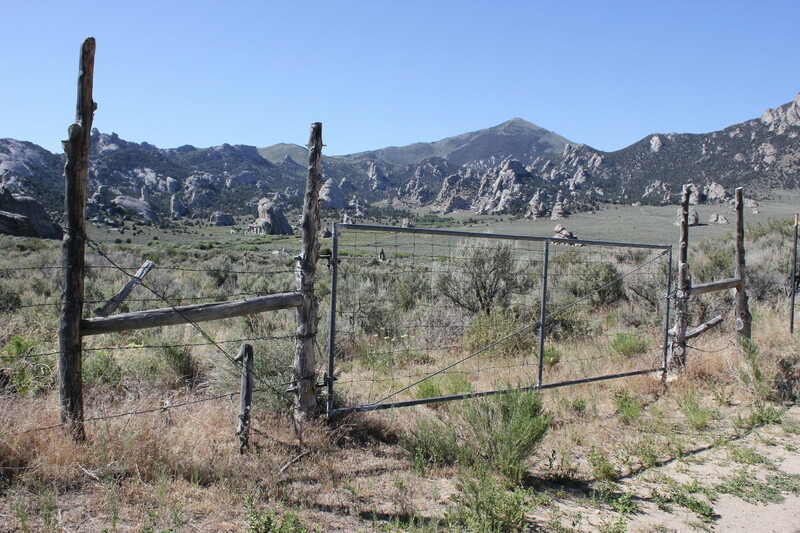 There was even an old wooden structure out back, framed by granite mountains. On our way out of the Reserve, we passed a VW van that was parked on the side of the road, its occupants still snoozing and dreaming of either finding a camp site in the morning or slipping out the back way before the Park Rangers went out to check for permits. We smiled. We left without paying, too. And in Burley, we found a busy Les Schwab’s with stale popcorn and an open bay for our rig. 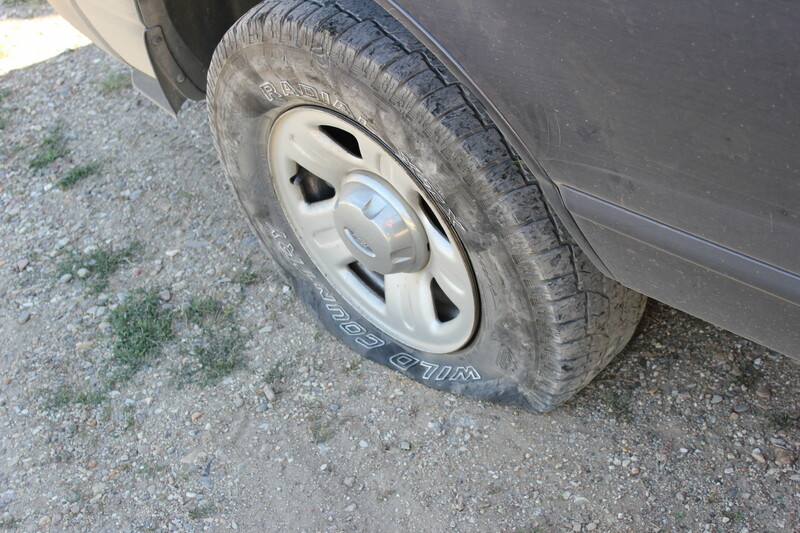 We bought two new tires plus an extra spare and wheel. $316.00 and some odd cents, less than we were quoted. It was Murphy’s second visit to a Les Schwab during a vacation. He’s getting to be a pro at listening to air ratchets and waiting to be lifted back into the rig in his doggie crate. 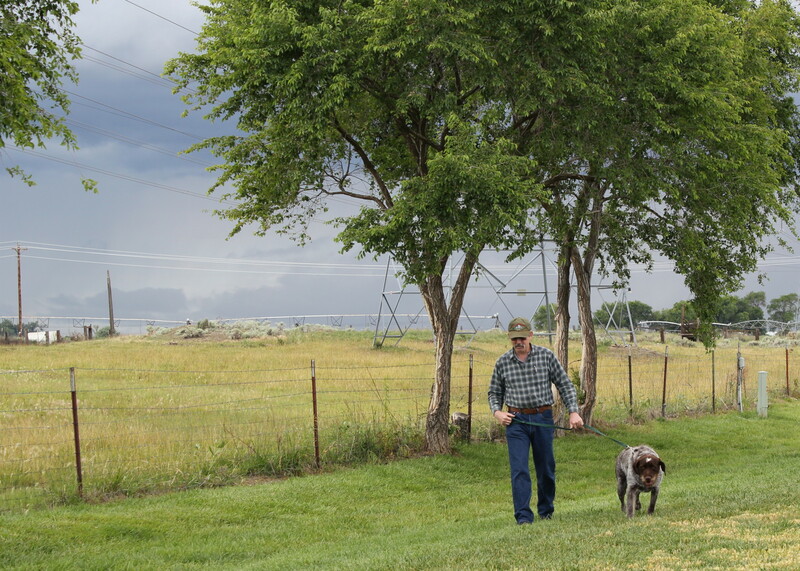 He was a conversation piece: some old Idaho farmer stood and bent Don’s ear while the tires were put on and I paid the bill. It was so nice and so “small town”. 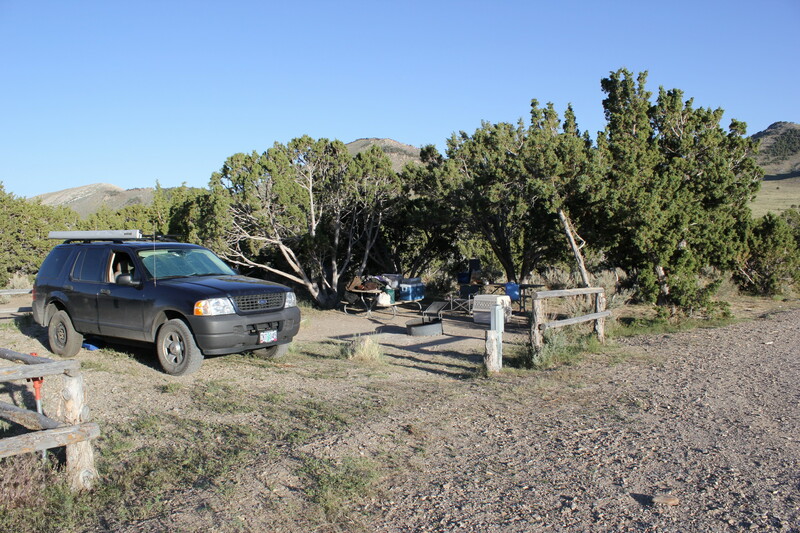 *We would not normally skip out on paying for a campsite, but we weren’t going to drive back up the same roads where we’d just put a rock through our tire just to pay for a site we weren’t even supposed to be in because there were only the two of us. We felt like there should have been a “Camp Ground Full” sign back at HQ or on the sign-in board. And there should have been one site for single party camping at the place we ended up at. Why should that entire area be designated as a Group Site? ** I’m jealous of all the tanned athletes climbing rocks. Not of their tans, but of their physical prowess. I’ve never been much of an athlete. And I don’t think I will ever desire to go off of a rock backwards! Don tells me it is fun, but I am skeptical.